Finally, we welcome warmer days, and with the changing of seasons unfortunately causes the appearance of ants in the house. Among them other bugs as well try to infest our kitchen and our household. This sounds familiar? So how do we solve this problem? Do not worry solution is not so complicated. Act in time and do not allow these small pests to overrun your household. Below find out how to get rid of ants in the house in a natural way without using any chemicals. Why do ants appear in our house? These small pests are generally omnivorous, and especially are attracted to fresh food. They will see your house as their food court and enjoy the remains of sweets, snacks, foods rich in starch and carbohydrates. You do not know how to solve this problem? Their favorite place in the house is the kitchen, so make sure you do not leave bits of food for them. Their colony counts over a thousand members. Once they settle into your home very it is very difficult to get rid of them. Because they are very small they easily go through all the cracks and appear almost everywhere. It sounds scary doesn’t it? Ants in the house, the bathroom, the kitchen, the cupboards, behind the fridge! Luckily besides aggressive preparations for the elimination of insects available to us are natural resources against ants. If you do not have a serious ant problem, these natural preparations will solve your problem quickly. Below read the recipes for the best natural resources that you can prepare yourself. But first we will learn about the two species of ants which are our most frequent problem. There are so many species of ants, but here are the most common: the pharaoh, yellow, black (garden) and red ants. In our household we usually encounter yellow and black ants. Entomologists estimate that in the world there are over 15,000 species of ants. When and where do yellow ants appear? Their Latin name is Lasius flavus. 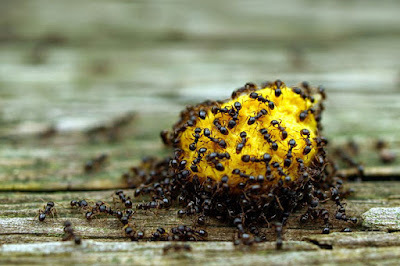 Small yellow ants in the home are more common than black (garden) ones. We often see them in the kitchen but it is common to see them in other parts of the apartment as well. So how do you solve this problem, is there an easy way? They occur throughout the year, regardless of weather conditions. they only sent their worker ants. Not all ants go for the food which makes their elimination very difficult. While you are exterminating one colony in the bathroom the other one is occupying other rooms. One group of workers brings food for the queen that is somewhere safe. Yellow ants prefer to spread all over the apartment. They live in the kitchen, bathroom, electrical installations, closets, wherever they can fit. For this reason it is considered that they are the most invasive species of insects that live in the apartments. If you do not react in time the ant colony can reach up to one billion. In order to solve the problem with ants you have to eliminate their queens. They are hiding mainly in the hollows beneath the parquet strips or close to the source of heat (parts of stoves, refrigerators, freezers). Queen, she creates the eggs (future workers) and can live up to several years. Workers, they go hunting for food and bring it to the queen and other workers. The lifespan of workers is only a few weeks. They can be both males and females. Yellow ant workers – they bring food to the rest of the colony. When one group returns to the colony with food the second group moves, they change like this sending only the well-rested ones. 90 percent of workers are hidden, while 10 percent goes in search of food. Extermination is a big challenge, it is not easy to find a way to solve the problem with ants forever. Therefore, action should be taken quickly and efficiently as soon as you notice them. If the problem is ignored the whole thing ends with complete disinsection of space with a professional insecticides. Therefore, if you notice the presence of yellow ants in an apartment make sure you immediately find the queen and kill it. Interesting facts- why ants have two stomachs? Ant-hull contains two stomachs. In one the ant keeps food for himself, in the second the food that he will share with the rest of the colony. Latin name of black ants is Lasius niger. In search of food these little ants will end up in your kitchen or bathroom. Its natural habitat is the area around the trees. They feed on rotting trees, food that you find in the area and the remains of other insects. During the winter they are inactive, but first thing in spring you can see them searching for food. Insect repellent that are used to keep away yellow ants will do the same to the black ones as well. You noticed some flying ants around your household? Worry not, flying ants are only males and unfertilized females that once or twice a year, flying out of the nest. They do this only for the purpose of mating. After mating the males will die and the females will lose their wings and will return to the nest to carry eggs. Also, these same females can educate their colonies. How to get rid of flying ants? Simply pick them up with a vacuum cleaner. In this way you will prevent their further propagation. And then concentrate on eliminating workers and queens. How to get rid of ants in the house in a natural way? Make yourself a natural remedy for ants in the apartment. We all have salt, sugar, vinegar, baking powder in our kitchen. Mixed with spices and essential oils, they will effectively drive away ants out of your house. Before use of natural resources, first thoroughly clean the apartment, all surfaces, corners, everything. In water with detergent add a little vinegar, it will destroy the furniture and will keep away these pests. This is an excellent natural remedy for ants. Small intruders simply cannot tolerate the smell of white vinegar. This is an inexpensive and efficient way to keep away these pests from your house. In a spray mix water and vinegar in a ratio of 1:2 and spray the critical points. If you see a crack in a wall or floor that can be their nest so just pour this mixture inside it. Pay special attention to electrical wiring. If you do not know how to get rid ants in the house, apply this combination to the places where they most gather. In an instant you will get rid of them. Boil water and add a little dishwashing detergent and you have made an excellent natural product. This mixture pour into spray and apply in places where ants gather. Instead of detergent, you can use plain grated toilet soap. Ground coffee is an effective tool against ants. These tiny insects cannot tolerate its strong smell and will flee from it. Coffee residue is also a good solution. Prepare them the "last supper"
Prepare them a meal from oat flour of corn. They cannot digest this food. This is a great trick because the ants will enjoy this delicious food and then die. Citrus juices, especially lemon is great against ants. Citric acid is something that these little pests will not cross. In all agricultural pharmacies you can buy chalk for the ants. Calcium carbonate from chalk will disperse them. It is enough just to apply it on critical areas. The alternative is child baby powder, they also have calcium carbonate. If you do not know how to get rid of the ants just powder the places where they gather. Use boric acid and forever say goodbye to ants, cockroaches, flies and other uninvited pests. Soak a cotton ball in the mixture of borax and sugar or honey. It's a real sweet poison for ants. The black and yellow ants in the apartment will run away from this product. He is a very good solution against ants. You just have to sprinkle a teaspoon of baking powder on an anthill. Then pour the heated vinegar, and the ants will die. Also, this is an effective natural remedy for eliminating cabbage worms and snails. Create a natural substance against ants only with water and salt. With the help of a spray, apply to critical surfaces. Have you heard of diatomaceous (silica) soil? Do you know how to get rid of the ants with the aid of diatomaceous soil? It is a small sand made of silicate rocks formed by deposition remains of algae diatom. It is deadly for insects because of their high absorption. Particles of diatomite, catch the body of insects and damage their coating. Then the insect loses water, dehydrates and eventually dies. Diatomaceous earth is also excellent for combating ticks, cockroaches, fleas, lice and other insects. It is noteworthy that in contrast to insecticides diatomite does not harm the human body. If you find ants in the house use this effective poison. Note: If you handle it more often, you are required to wear a protective mask in order not to breathe it in. In this case it is harmful to the lungs. How to solve the ants in the bathroom, give it a wonderful smell? The solution is the essential oil of mint! It is an effective remedy for ants and moths. Mix 30 ml of essential oil, and one liter of water and cover the surface with it where ants gather. Do you know that you can get rid of ants in the house with the help of aromatic spices? Cloves, bay leaves, cinnamon in particular will drive ants crazy with its strong fragrance. Sprinkle places where you notice the ants are gathering. What to do if the invasion has taken on such proportions so natural resources cannot help you? There are various insecticides for ants of which the most popular is Raid. You can buy the so called ant houses, Raid, Etiol, Neopirox (efficient with cockroaches, flies). How to solve the problem with ants with the help of Raid? Of course with insecticide you are not safe as when it comes to natural resources against ants. You must be careful when applying it on the treated area especially if you have small little kids and pets. Always keep these substances out of their reach, and it is very important to move it away from food for dogs and cats. Raid trap for the ants you is available in many mega markets at a price of 13 dollars. Sprays costa round 5 dollars. You've tried all natural resources, and you tried pesticides and the ants are still there? In some cases, such as for instance with yellow ants where many queens are skillfully hidden you must resort to a serious extent - disinfection. Professionals come to your house and exterminate these pests. Prices for disinfestation depends on the size of the object. It can vary from place to place so inquire about the price first if you have resorted for such a thing. We hope that we have helped you a little, we recommend our earlier article - how to protect yourself from insect bites.